What a fantastic place to meet travellers! It is built especially for partiers but there is a nice quiet set of dorms across the street. It was paradise! This hostel was perfect for what we were looking for. 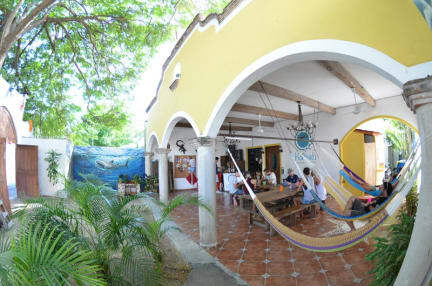 Close to the bus station to make for easy trips to Chichen Itza & Tulum, a night market minutes away, bar at the hostel, and strong WiFi. We stayed in a private room and it was clean and large. The beach is a little far but you can take a bus for cheap or catch a taxi. Thanks to Laura and Iorena (I’m sure I’m spelling that wrong) for helping us out and making this place a great experience! The staff is super friendly! Great Hostel! Staff were awesome and super easy to meet other travellers. Party hostel so if that is your thing that I highly recommend. Great if u are 18-25 traveling alone and want to meet people. The stuff really makes the effort to make you feel included. Cheeky drinking games invitations in the evening. Starting as "wanna play uno?" and ending up that it's drinking uno and you have to buy from the bar. Biggest issue was the loud music till 2:00am every night. Overall nice experience. Not recommended for people who want to quietly relax evening-nighttime. This hostel could be greatly improved with little effort. It’s really filthy. The music is played far too loudly in the common area, too. Most of the staff is pleasant. Good location. In need of repairs - i.e., the hammocks and toilets.